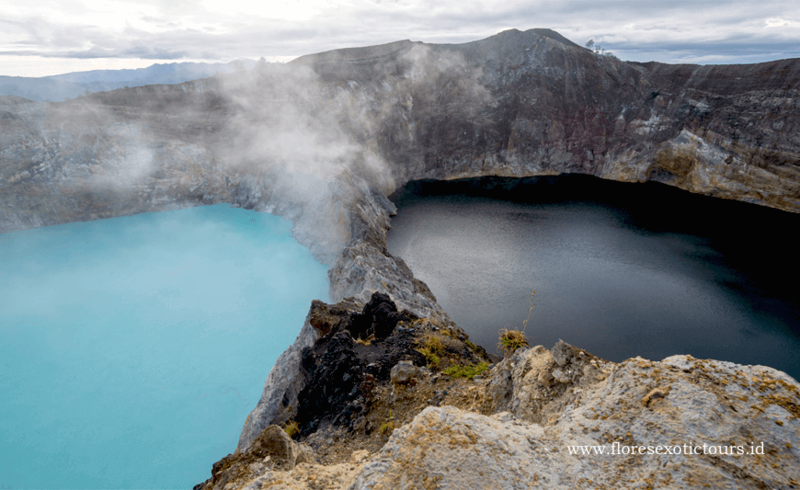 Mount Kelimutu, with its three-colored crater lakes, is probably the most amazing natural phenomenon in Flores. Beyond that, the ‘steaming mountain’ is also the island’s most famous tempat angker, or mystical, haunted place. Scientific explanations aside, there are many myths about the origin of Kelimutu. This is one of the reasons why Mount Kelimutu was, and still is a sacred place for the local people. Over the years, the three crater lakes have often changed color. At present, one of the lakes is black-brown, one is green, and one is currently changing from green to a reddish color. A reason may be the varying mineral contents of the water. Another explanation suggests that the changing colors are caused by the neglected ancestral souls.